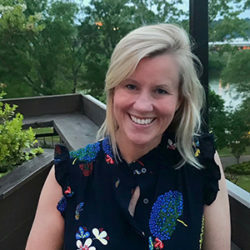 Lynn was introduced to No Barriers’ life-changing organization through her work in development and corporate communications in North Carolina. Originally from Los Angeles, Lynn spent many years working in the entertainment industry before relocating to Asheville with her husband for a family business. Lynn continued her work in regional theatre as the Director of Development for Flat Rock Playhouse, The State Theatre of North Carolina, and started her own business, 6 Pence Productions, creating “Audio Children’s Theatre,” CD’s which she licensed with Parents Magazine and sold nation-wide in Target Stores. Lynn then transitioned into corporate development and sales with the Cliffs Communities in North and South Carolina and was fortunate to work with No Barriers, helping to build the No Barriers Outdoor Classic, one of the most significant fundraising events for the organization. While focused on raising four daughters, Lynn has always felt strongly about living a meaningful life with purpose and not letting barriers interfere. When she first met the No Barriers team and discovered their mission, she felt like she had found her purpose and home. Lynn is a graduate of Southern Methodist University with a BFA in Theatre and a minor in Art History. She lives in the beautiful mountains of Asheville, NC with her husband of 25 years, four incredible daughters, and two very spoiled, adorable dogs! She loves to travel, spend precious quality time with her family, run, hike and ride horses whenever possible!